Dashing through the snow…Giddy up, let’s go…there are several songs going through my head as I write this article. And no wonder! There’s something so magical about horses and snow and sleighs all mingled together. 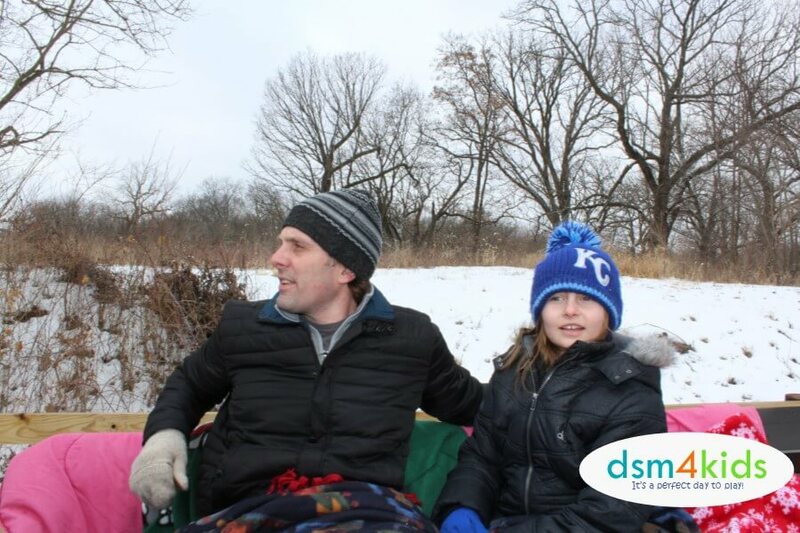 My family had the opportunity to take a sleigh ride at Jester Park Equestrian Center last year and really enjoyed it. Check out all the fun details and pics from that outing below. Hours of Operation: Monday through Sunday; 9:00 am to 5:00 pm. Cost: Private Sleigh Ride (seating between 5-8 adults) – $125; Wagon Rides (under 20 people) start at $50; Large Group Wagon Rides (5-100 people) starts at $100. Length of Ride: Sleigh Rides are scheduled on the hour and the first 10 minutes are for group check in. The rides depart promptly at 10-minutes after the hour. Rides last approximately 45 minutes. Food: There are no concessions available at Jester Park Equestrian Center. However, you can bring your own snacks and non-alcoholic drinks along, to take on the sleigh ride. Restrooms: There are restrooms available on site. Prior to your visit check out Jester Park Equestrian Center’s website where you can make your reservations on-line. 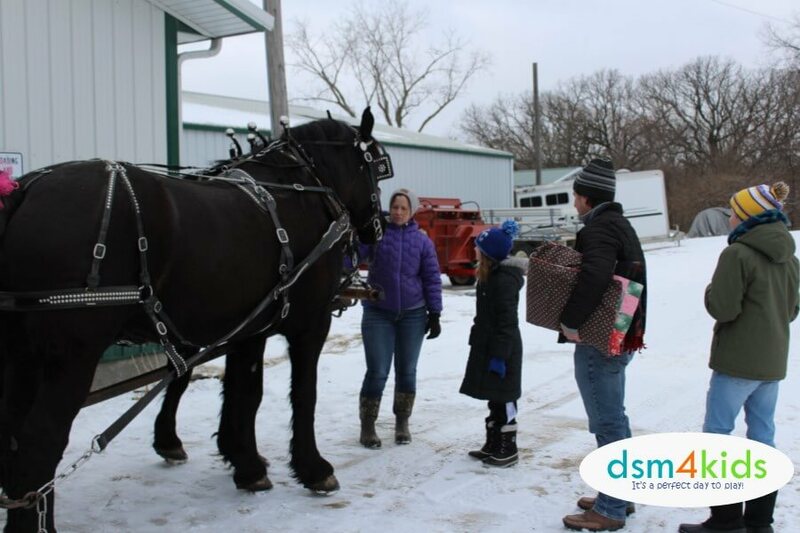 Jester Park Equestrian Center, which is located in Granger, just 25-30 minutes northwest of Des Moines, offers horse-drawn sleigh and wagon rides throughout the winter. 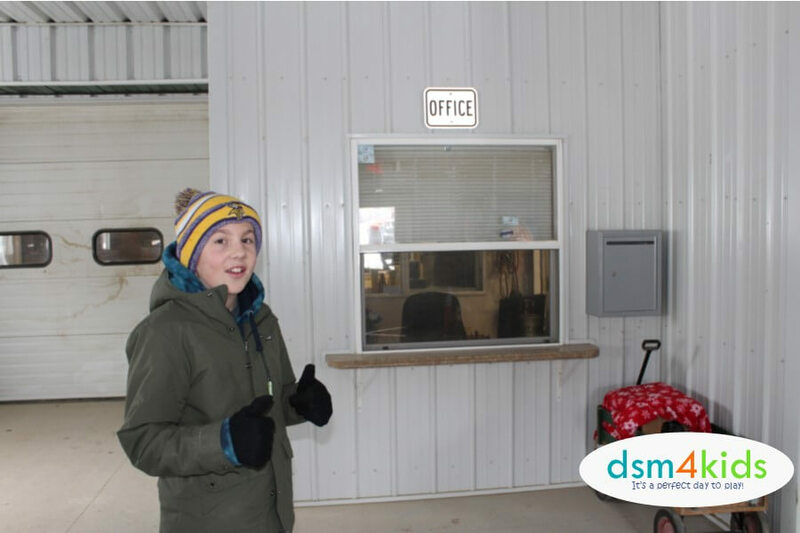 We checked in at Jester Park Equestrian Center’s office about 10 minutes before our scheduled private wagon ride. We met our “drivers”, who were very friendly and were happy to introduce us to the horses (Percheron Draft Horses – Ajah and Tik) and answer questions before, during and after our ride. Jester Park Equestrian Center (JPEC) has wagons and sleighs in several sizes to accommodate private groups large and small. Our wagon had space, and some to spare, for the four of us to ride together. During our visit last year, the winter temperature was mildly cold with just a little bit of snow on the ground. In case there’s not enough snow for the sleigh, Jester Park Equestrian Center will use their horse-drawn wagons instead. It was still a fun and unique experience! Holiday Sleigh Rides are scheduled for December 24, 26, 27, 28 and 29, 2018. Just so you know, Sleigh Rides require a minimum of six inches of packed snow as a proper base for the sleighs to operate safely and effectively. 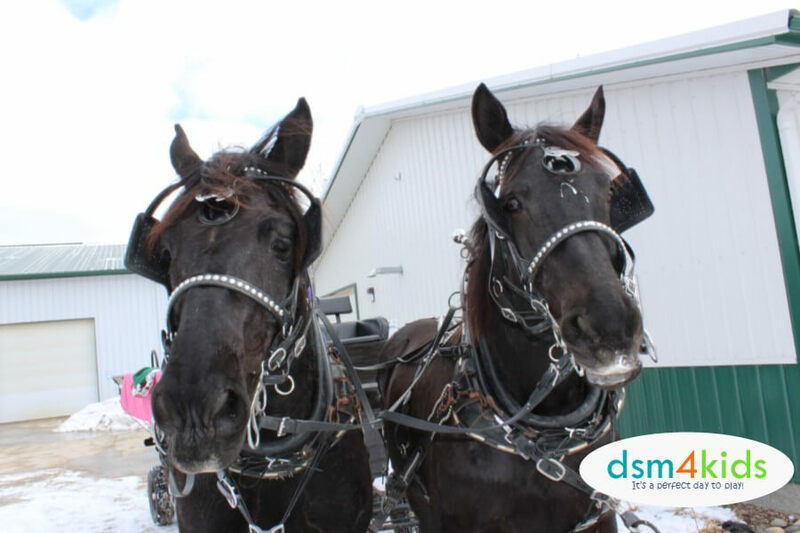 Sleigh Rides, other than the holiday rides, are NOT BOOKED in advance of snowfall. You will need to keep an eye on the weather and JPEC’s Calendar to see when they’re taking reservations. Sleigh Rides may be substituted for a Wagon Ride at the discretion of JPEC. 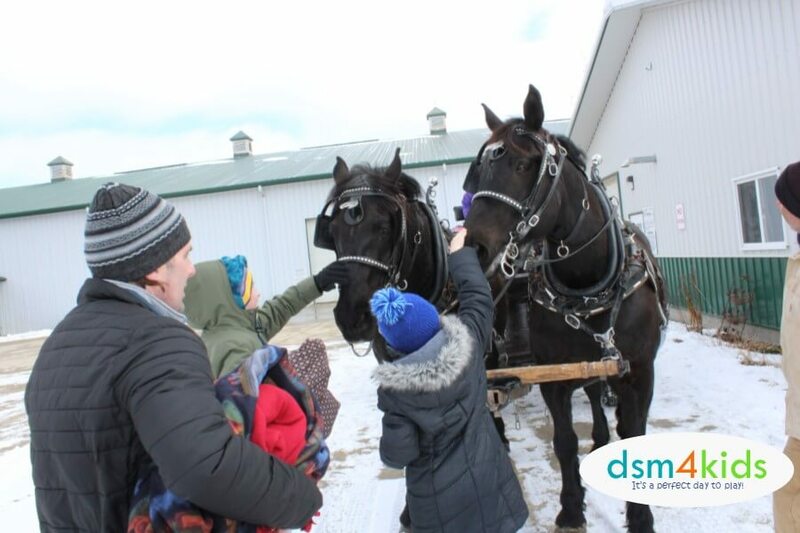 Wagon Rides can be booked throughout the year. 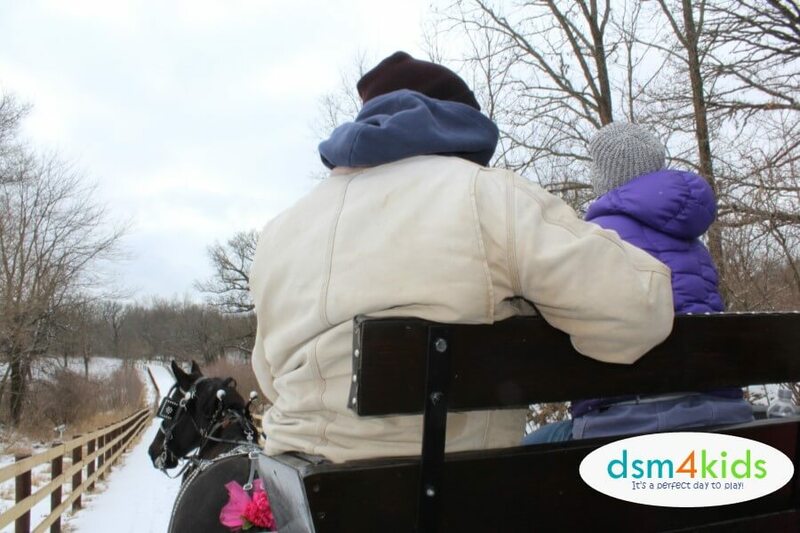 No matter if you’re in a sleigh or a wagon, you’ll meander along a lovely trail through the woods towards Saylorville Lake, make your way around the bend, and head back to the Center. Along, the way you’ll take in some lovely views and crisp winter air as you glide along the snow. Remember to bring your camera, the sleigh ride is sure to have moments you will want to capture from nature views to views of your friends and family. Dress Warmly: You’ll be sitting outside in the cold for about an hour. Because you are not moving, you will get cold quickly. There were a few blankets provided on the wagon, but I would suggest bringing your own blankets too – some to sit on and some to cuddle under. Book Early: Winter weather in Iowa is unpredictable. Your sleigh ride might be cancelled at the last minute. Avoid disappointment by booking as early as you can so, if you must postpone, you will still have time to re-schedule. Bring Snacks and Hot Chocolate: Snacks just make everything better. If you do decide to bring hot chocolate on the sleigh, I suggest putting it in a cup with a lid, it’s a bumpy ride. Or, just wait and enjoy it after the ride. Fill the Sled: It would be really fun to gather a sleigh full of friends and family! Have you taken a sleigh ride at Jester Park Equestrian Center? What are your tips?